… to my website! I’m glad you stopped by. Feel free to browse around, and enjoy your visit! Lots of info here about recent research that indicates many dog kibbles which contain legumes (peas) and potatoes are causing taurine deficient Dilated Cardiomyopathy (DCM). PLEASE read the links below. This is beyond scary and DCM can be silent until the dog is going into Congestive Heart Failure or can cause the dog to have heart arrhythmia resulting in immediate death. June 5, 2018 – PLEASE read and SHARE new Tufts clinic nutritionist article Entitled: A Broken Heart: Risk of heart disease in boutique or grain-free diets and exotic ingredients on my News page. 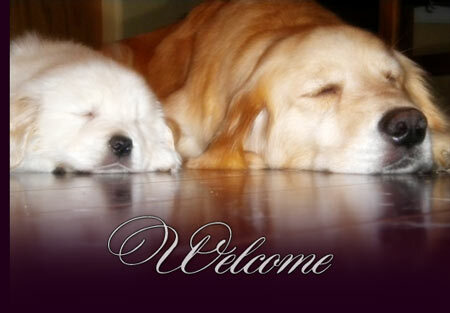 Thank you for your interest in Aubridge Goldens! Proudly, we have been active in the breed, primarily in conformation, for over thirty years (initially under the kennel prefix of Robin’s). Goldens are a wonderful breed and we have tried diligently to breed to the AKC standard, striving for that perfect Golden! The breed standard can be found either on the AKC website or on the Golden Retriever Club of America’s website (also see the AKC and GRCA links on the Resources page). Within my website you’ll find information about my past and present Golden Retrievers and each will have their own page – please find their links listed under our dogs! Upcoming litter information is also listed under dogs. And, there is information and resources listed under the Resources page.